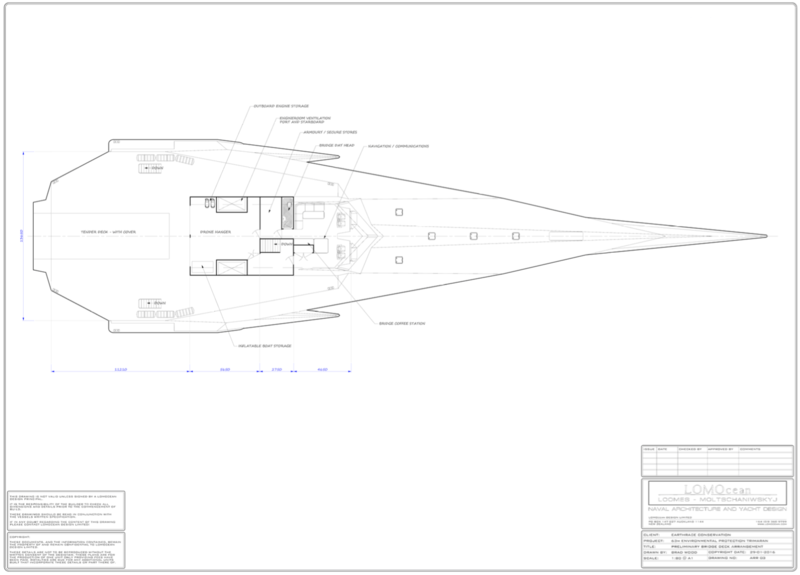 We are developing an awesome new vessel “EARTHRACE-2” to substantially extend our work in marine conservation. It will target illegal fishing by foreign vessels, waterborne wildlife smuggling, and training local fishery enforcement units – All extensions of existing campaigns on our vessel SPS Modoc. We may also consider running conservation missions such as island pest eradication or scientific research to remote locations, depending on where our main operations are happening. 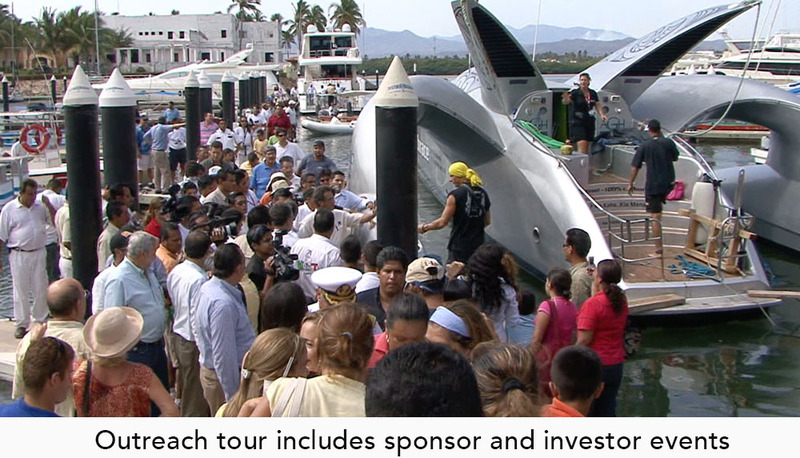 We’ll also run an outreach tour each year, giving our sponsors and investors opportunities to utilize the vessel, and increasing our reach and profile. Below are some project videos, including details on Design. EARTHRACE-2, like her predecessor, will be a technology marvel, and one of the most awe-inspiring vessels the world has ever seen. Our video above discusses many of the things that make this boat so special. 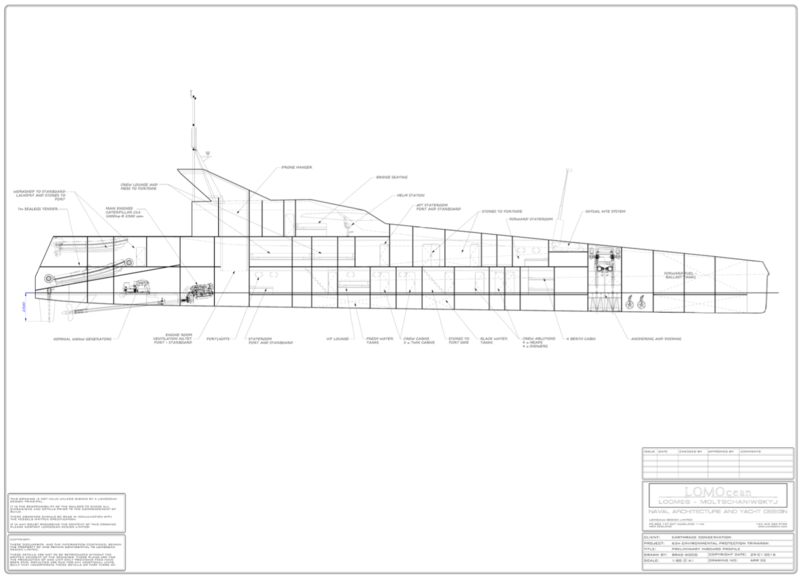 EARTHRACE-2 hull form has been extensively tested using computer modelling. The simulation above has her traveling at high-speed in 30m (100ft) seas. Such tests allow us to accurately predict loads in extreme conditions, that in turn drives design. The most obvious thing about EARTHRACE-2 will be her form – One of the most awe-inspiring vessels the world has ever seen. More than that however – she will be a technology showcase of the latest in maritime and surveillance hardware. 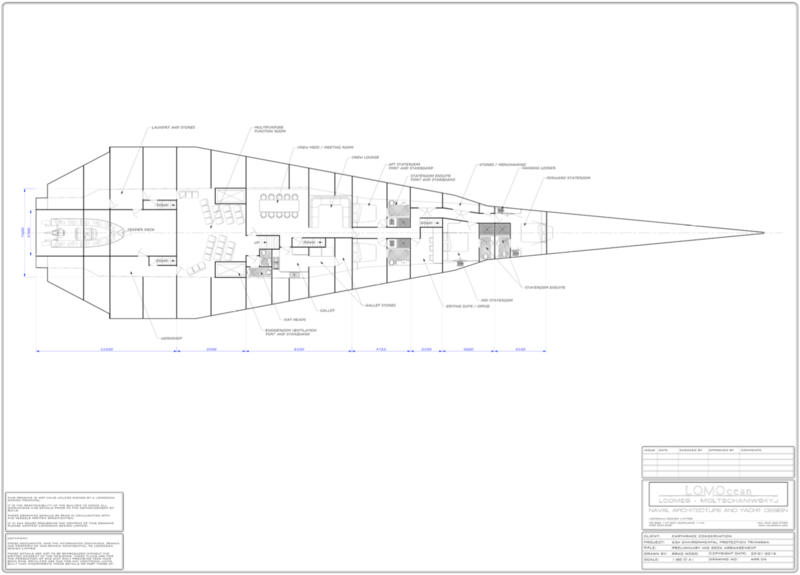 This includes Schiebel S100 Drone with 200nm range, ELINT electronic detection system, FLIR thermal Imaging, a helm resembling that of a modern plane, FC470 Milpro zodiac, 10m amphibious RIB (launched astern from a roll-off platform), and a 30-person theater / briefing room. 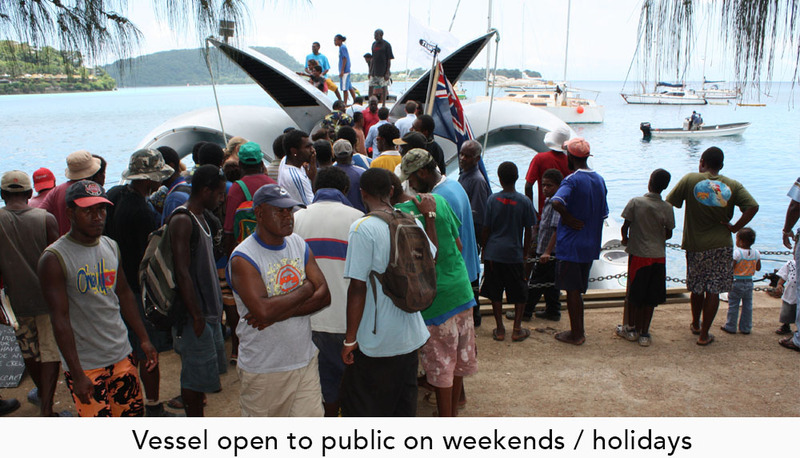 The hull form has been extensively tank-tested in Melbourne (Australia) under various displacement and thrust conditions, allowing accurate predictions of final vessel performance. Video above was from one of these tests. 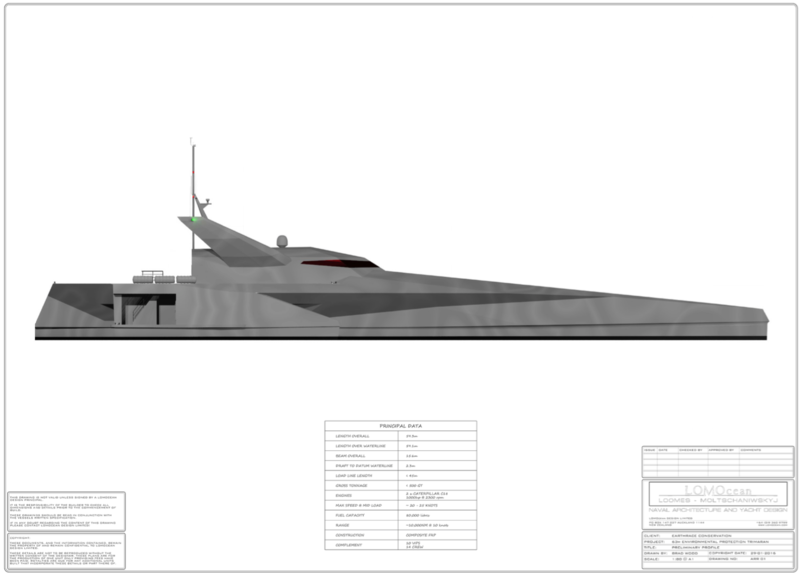 The above animation was rendered from the 3D CAD files used in doing computer modelling of vessel performance. She is 3 stories high, however final layout may still evolve somewhat. EARTHRACE-2 is based on the original Earthrace, a 24m trimaran that set a new world record (that still stands today) for circling the globe, running 100% biodiesel fuel. 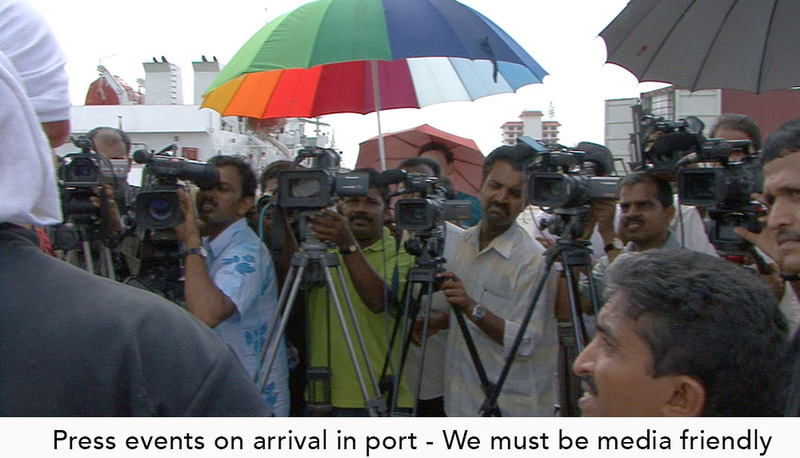 In 2009 she went to Antarctica and became the star of Animal Planet’s Whale Wars TV Series. Earthrace set the benchmark for uncompromising focus on efficiency, functionality and awesome good looks. EARTHRACE-2 is looking to repeat this, but with a much bigger vessel that will take things to a completely new level, and change the way the world views conservation campaigns. 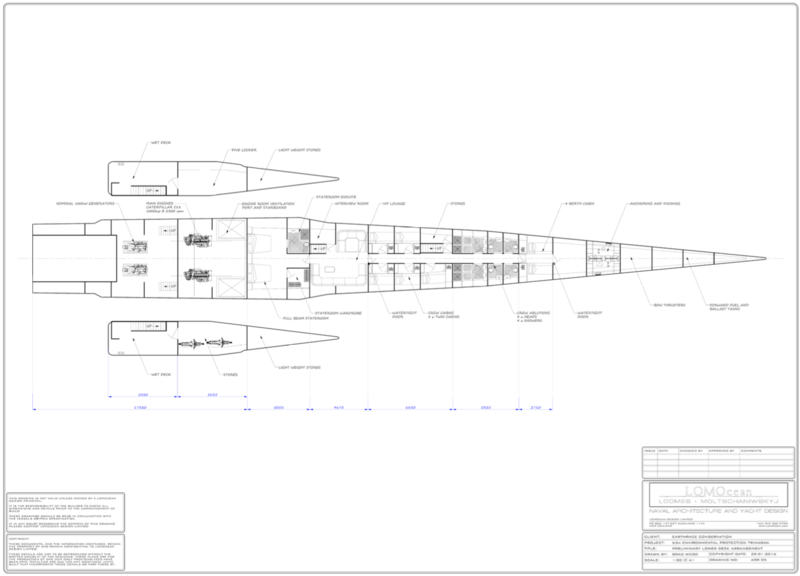 Hi-Res CAD files can downloaded here. We recently ran a successful Kickstarter campaign for completion of the concept design. This raised over $90k from 700 backers, allowing us to develop an accurate budget to complete the build. The original Kickstarter video is above. The Earthrace team has a proven track record – The world’s coolest boat (Earthrace), a world record, 2 seasons of compelling conservation TV, and successful wildlife missions run in all corners of the globe. 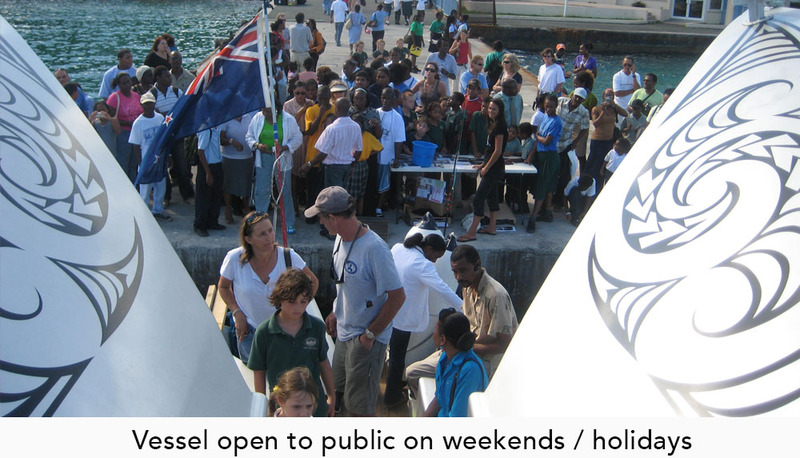 For a period each year, the vessel will run on an outreach tour, calling to port cities in the areas we operate. 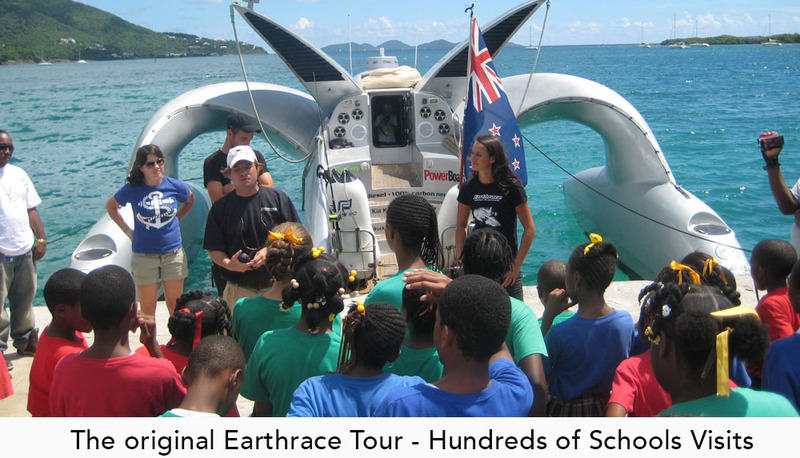 Tours are modeled on the original Earthrace campaign that saw our vessel host over a quarter-million people in 3 years, and featured in countless news items and stories. 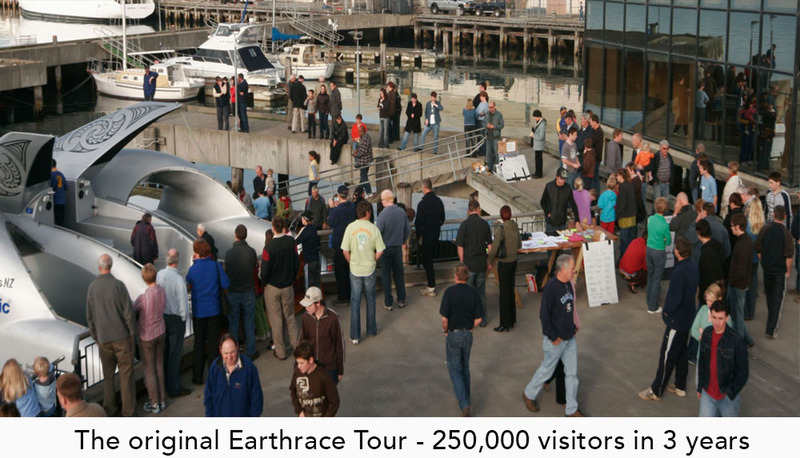 EARTHRACE-2 is ideal for hosting events, with a capacity of 200 guests in port, and 50 guests on day or evening voyages. The 30-person theater is ideal for hosting school groups, press conferences, or for public viewing of our many TV Episodes and video content. Musicians, celebrities and local heroes can be interviewed here in live broadcasts across our many platforms.